Europa seems to be covered with a layer of ice. And beneath that layer, is believed to be an ocean which covers the entire globe. If there is that large of an ocean indeed, it would be larger than all of earth's oceans combined. This ocean is believed to be made from water. Now, let's see what else do we know about this moon. The surface of Europa is covered with cracks. The cause of these cracks cannot be known for sure, but it is believed to be due to strong tidal forces at play on a hypothetical ocean beneath the ice. It is slightly smaller than the Earth's moon. It is 750,000,000 km (or 485,000,000 miles) from the Sun, more than five times farther than we are. It orbits Jupiter every 3.5 days, and it is phase-locked with Jupiter just like our moon is locked to Earth. 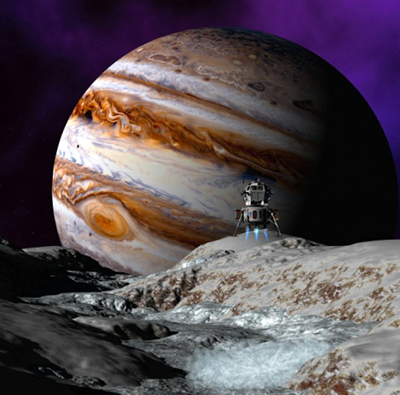 So only one side of Europa could be seen from Jupiter, no matter when you look, just like we see only one side of the Moon all the time. In the Western world, Europa was discovered by Galileo Galilei, in 1610.